I had an interesting revelation partway through watching Snitch. About a half hour into the film, I was sitting there, munching on my popcorn, when suddenly it hit me: Snitch is Breaking Bad The Movie, or at least as close as a studio can get to it without having to get adaptation rights. 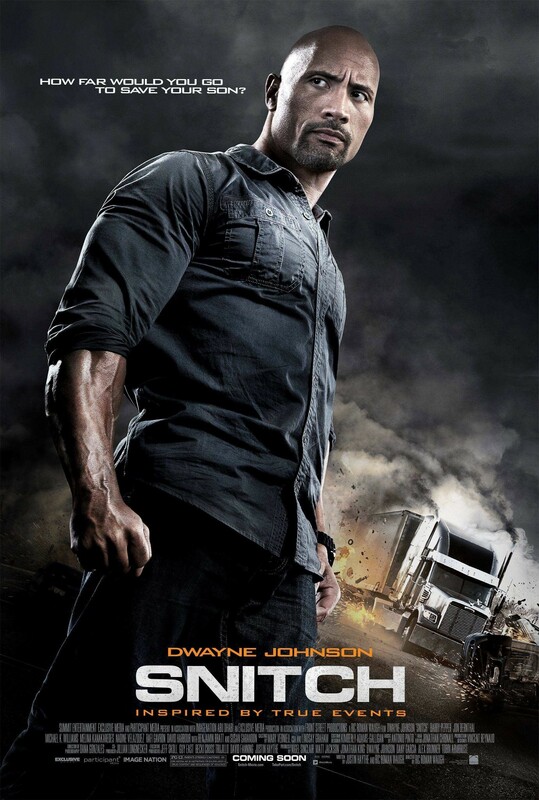 The film stars Dwayne “The Rock” Johnson playing a character named Not Walter White whose son has been arrested by the DEA after receiving a package from an old friend containing a copious amount of ecstasy pills. Turns out Not Walter Jr.’s old buddy got caught by the DEA as well and he turned around and squealed on poor hapless Not Walter, Jr. Because of mandatory minimum sentences Not Walter, Jr. is facing ten years or more in Federal prison unless he cuts a deal to set someone else up, even if they’re just a recreational user, not a dealer. He refuses, so it’s up to Not Walter White to find a way to reduce his son’s sentence. Not Walter arranges a meeting with District Attorney Not Saul Goodman (played by Susan Sarandon) who happens to be up for election in a Congressional race and refuses to budge on the mandatory minimums lest she look as if she’s being soft on drug crime. However, Not Walter proposes a deal where he would involve himself in the world of drug dealing in order to help his son. Specifically, he agrees to set up a local drug dealer in exchange for reducing his son’s sentence. He teams up with one of his employees, an ex-con named Not Jesse Pinkman, and the two of them find themselves wrapped up in the shadowy world of drugs, violence, and cartel criminals. Snitch claims to be “inspired by true events,” but I get the distinct impression that some studio executive at Summit Entertainment was more “inspired” by the success of Breaking Bad and wanted to try to cash in on a similar-ish premise. There are obviously differences in the story, and I wouldn’t accuse it necessarily of being a naked rip-off, but it shares a number of not insignificant similarities. The biggest problem, though, is that it doesn’t approach the subject with even a fraction of the care or craft that Breaking Bad has. I haven’t read the screenplay for Snitch so I can’t effectively comment on how it’s written, but the film is full of shallow characterizations and awkwardly obvious dialogue that I imagine goes back to screenplay issues. As I said, though, I can’t be completely sure. Regardless, there were more than a few times when the film spat out a painfully trite line or created a scenario that lacked any semblance of authenticity. Susan Sarandon’s character is a bad cliché of a politician who lacks even an ounce of humanity and Not Walter, Jr., who is practically angelic, is constantly portrayed as a complete innocent who is merely a victim of circumstance. That one in particular rang really hollow for me, as the whole film depends on caring about his plight, and I couldn’t muster up a reason to care at all. They were too heavy handed with the sympathy card and it ended up losing any weight it might have had. If, perhaps, they had given the character more dimension and portrayed him more as someone who willfully did something foolish without considering the consequences it might have resonated better. After all, we all find ourselves doing stupid things that we regret, and we naturally relate to that. As for Dwayne Johnson, I actually like him quite a bit. He has a lot of charisma and he isn’t a bad actor; a lot of times he can be quite fun in his roles. In Snitch, though, he really doesn’t have much to work with. His character suffers from the same mono-dimensionality of most other characters in this film, and the awkward dialogue they have him read doesn’t do him any favors. It seems as if he’s using this film as an attempt to transition into more dramatic roles, but this was a bad first choice. Hopefully whatever he chooses next will give us a better idea of what he’s really capable of in a dramatic role. Finally, let’s talk about the elephant in the room: action. Though the film itself is decidedly more dramatic, the marketing went out of its way to make it look like an action film. This was obviously an attempt to draw in the type of audience that Dwayne Johnson typically attracts (when he’s not making kids movies, that is), but the movie does offer a handful of action set pieces. Unfortunately, though, most of them are pretty bland and generic. There’s no spark to the style of Director Ric Roman Waugh, and while the action is functional it comes across as a retread of the same action beats you’ve seen done better a thousand times before. I’ll give credit where it’s due, though, and say I really appreciated that most of the action stunts seemed to be done with practical effects rather than the budget CGI that these kind of productions often have. It’s better than the big sloppy mess that was last week’s A Good Day to Die Hard, but it’s still nothing terribly noteworthy. In the end there’s not a lot worth talking about here. Snitch basically amounts to a low-rent Breaking Bad complete with shallow characters and trite dialogue. There’s nothing particularly awful about it, but it’s not very good either. It’s just a bland film with flavorless directing; one that lacks any compelling reason to see it. Good review. If you get past the ever present social commentary you’ll able to get into the engaging story while also seeing a real issue that won’t go away after the credits roll.